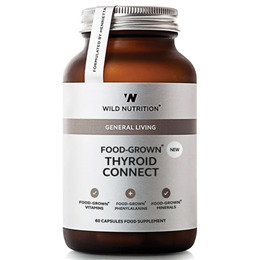 This holistic blend of Food-Grown vitamins, minerals, amino acids and botanicals has been expertly formulated to comprehensively address thyroid health. This formula addresses all areas of health that support the thyroid such as energy, the adrenal glands, nervous system and immune system. Suitable for use with prescription thyroid medication and thyroid glandulars. With iodine for optimum thyroid function. This Food-Grown Iodine provides preferred food forms of iodine. With Holy Basil (Tulsi) for natural reinforcement of systems that counter-support the thyroid. With Selenium for normal thyroid health and T4/T3 hormone conversion. Below are reviews of Wild Nutrition Food-Grown Thyroid Connect - 60 Capsules by bodykind customers. If you have tried this product we'd love to hear what you think so please leave a review. This holistic blend of Food-Grown vitamins, minerals, amino acids and botanicals has been expertly formulated to address thyroid health. This formula addresses all areas of health that support the thyroid.